"Branch manufactury: Machinery Hall, -- American Department, (Central side entrance, by the lake.) 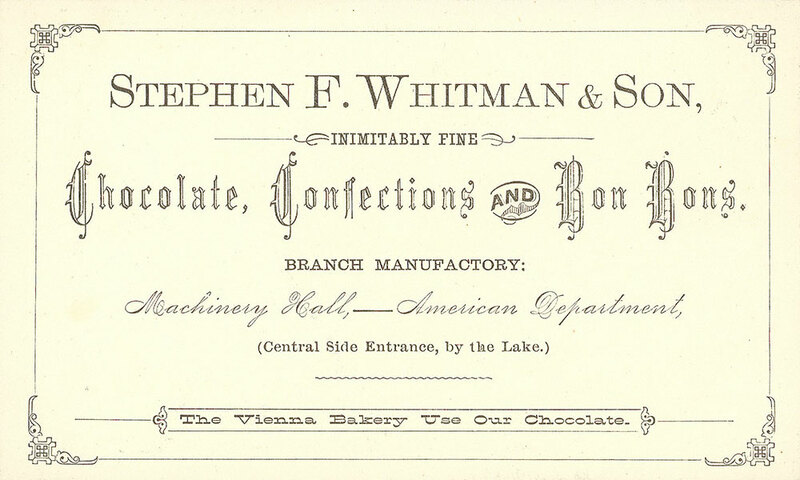 The Vienna bakery use our chocolates." -- Verso of card. 1 trade card : 13 x 8 cm. 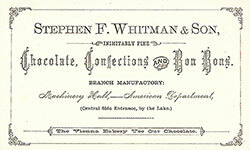 Exhibit title: Whitman, Stephen F. & Son, Philadelphia, Pa., Exhibit #254, Agricultural Hall, bldg #52. 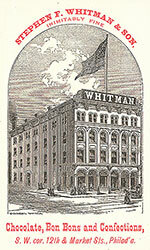 Trade card for Whitman's confections with recto drawing of its facility with American flag. Pedestrians and carriage in foreground. Text on verso. Red and black ink on white card.